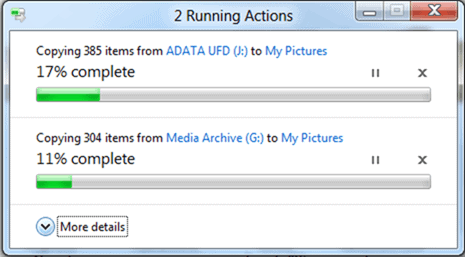 The default Windows file management tool Windows Explorer is in dire need of an overhaul. This includes - in my humble opinion - changes to the interface but also capabilities of the software. Microsoft recently made the announcement that the company will improve the file management capabilities of Windows Explorer in the upcoming Windows 8 operating system. The changes address issues that Microsoft has identified after analyzing usage statistics of hundreds of millions of Windows users. Findings include that 20% of all copy jobs take longer than 2 minutes to complete and that 5.61% of all copy jobs fail. Consolidate the copy experience to improve managing and monitoring capabilities. Remove distractions and concentrate on the information that users need. Give Windows users more control over the copy operations. Copy jobs now run in one window, instead of multiple ones. If you currently start multiple copy jobs in Windows, you will notice that each displays the copy process and information in its own copying window. In Windows 8, users will see all of their jobs in one window. Experienced users may have already noticed the pause icon next to each copy job in the above screenshot. It is now possible to pause specific jobs, for instance to speed up an important copy job. A click on More Details is now revealing detailed information about each copy job, including realtime throughput data of each job. 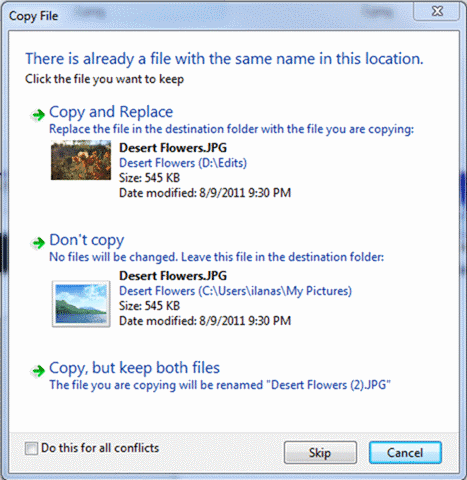 Microsoft is also addressing the conflict window that is for instance displayed when a file already exists in the destination folder. The current conflict resolution dialog is confusing and not clear at all. The new conflict resolution dialog displays less information on the screen, but enough to allow the user to make a decision right on the screen. While I'm not entirely sure how the dialog will look like if there are dozens or even hundreds of conflicts, I can see its use for a small number of conflicts. You can read up on all the improvements at the Building Windows 8 blog. 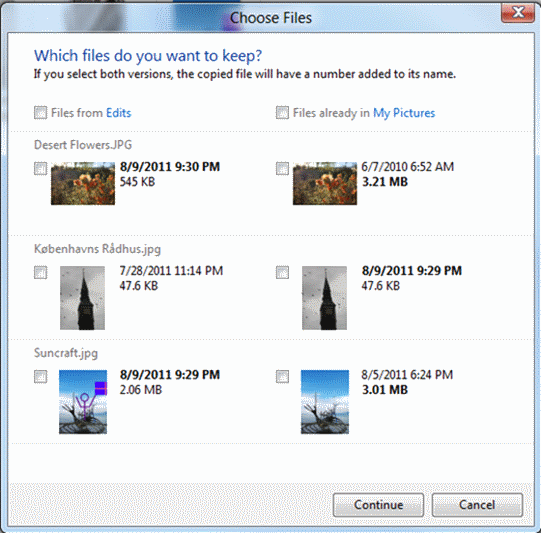 Microsoft's Windows 8 operating system comes with Windows Explorer updates that will improve the copy process among other features. With all current versions of Windows, the copy process stops when a corrupted file is reached. This makes programs like Roadkil’s Unstoppable Copier necessary. 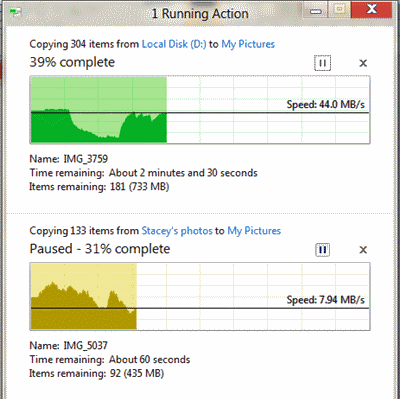 Do you know if this issue will be addressed in Windows 8? Personally, I would like to see options for the treatment of this issue. For example, there should be check boxes to halt on error, ignore corrupted files and continue copying, and attempt corrupted file recovery which would include a numerical input field for the number of retries. Andy I do not know. Would be great if Microsoft would add more improvements. This is really cool, I’m glad they’re making clever improvements like this and not focusing entirely on the touch screen stuff. Do you think that there is a possibility that there will be a feature to play/view gif files? Great idea and seems to be nicely implented. Man now its gonna be easier and faster!